Stuck At Sea – Who Would You Take? This morning I read an article about two men who survived 33 days at sea. This particular article manages to condense their ordeal into three (longish) sentences. Five weeks with one person in a small boat. The men were 53 and 26 years old, no idea whether they were relatives, friends or lovers. Maybe they were complete strangers. It made me think about, if I had to choose, who I’d would want to be stuck with. Now, this is not even a “Who’d you take to a desert island” – at least you can park yourself on the other side of the island if you need some private space. It’s not even being stuck in a lift when you know someone will save you somehow. 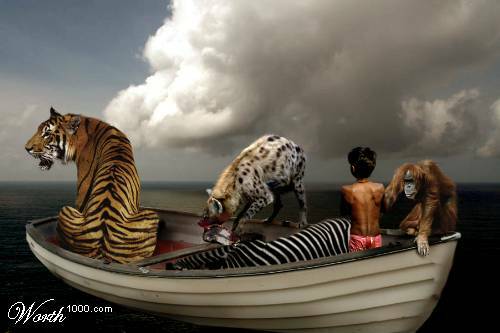 It’s like a poor man’s version of Life of Pi – and the more I think about it the more complicated it gets. See firstly, there are the slim survival chances. Personally, I don’t mind dying but as a Dutch comedian once said: ” It’s not my own death that upsets me, it’s the death of others that bothers me.” For that reason, my very cool sister, who I consider great company, is off the ‘Stuck at Sea’-list. Despite these chances you’d want to be with someone who doesn’t panic. Survival rates are higher if you don’t jump off the boat come Day 4. People who need a lot of medication or inhalers are therefor also not ideal. You would need someone who has a sense of humour, if you can’t cry about it, you might as well laugh right? It should also be someone who I could talk about fears and life about, I’m an extrovert: keeping it all in would make my face break out. That would be the last thing I’d want: Stuck at Sea and a flaky face. Someone I could fight with without either of us holding a grudge afterwards – because disagreements will definitely happen and that would be a very awkward boatride after Day 7. It would have to be someone I am not attracted to: trying to survive at sea should not be marred by raging pheromones. Someone who I’d be so comfortable with that by the time we’ve seen the good, the bad and the ugly of each other, we’re still ok in the same boat. Slowly, slowly as I was thinking of all this, the person who’d I choose to be stuck with appeared. The question is of course whether that person would feel the same! Stuck at sea with one person. Who would you take? You Know How to Whistle… Don’t You Steve?